Ethics for Robots describes and defends a method for designing and evaluating ethics algorithms for autonomous machines, such as self-driving cars and search and rescue drones. Derek Leben argues that such algorithms should be evaluated by how effectively they accomplish the problem of cooperation among self-interested organisms, and therefore, rather than simulating the psychological systems that have evolved to solve this problem, engineers should be tackling the problem itself, taking relevant lessons from our moral psychology. Leben draws on the moral theory of John Rawls, arguing that normative moral theories are attempts to develop optimal solutions to the problem of cooperation. He claims that Rawlsian Contractarianism leads to the ‘Maximin’ principle – the action that maximizes the minimum value – and that the Maximin principle is the most effective solution to the problem of cooperation. He contrasts the Maximin principle with other principles and shows how they can often produce non-cooperative results. Using real-world examples – such as an autonomous vehicle facing a situation where every action results in harm, home care machines, and autonomous weapons systems – Leben contrasts Rawlsian algorithms with alternatives derived from utilitarianism and natural rights libertarianism. 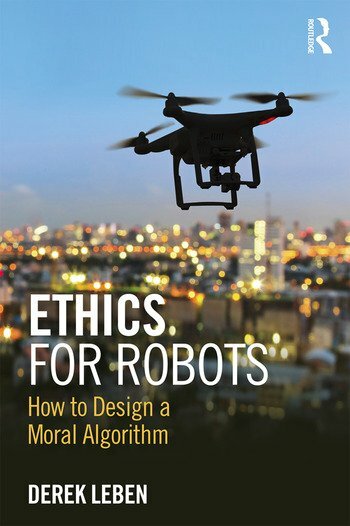 Including chapter summaries and a glossary of technical terms, Ethics for Robots is essential reading for philosophers, engineers, computer scientists, and cognitive scientists working on the problem of ethics for autonomous systems. Derek Leben is Associate Professor of Philosophy, University of Pittsburgh at Johnstown, USA.